With the return of Doctor Who later this week, I figured it now would be a great time to post some cool Doctor Who clothing. For the TARDIS loving ladies out there interested in celebrating the return of new Doctor Who episodes, I have found a skirt that I think you are going to love! In the past I posted a skirt that was a giant TARDIS but unlike that one, this one has a bunch of TARDIS’ and Timelord writing! 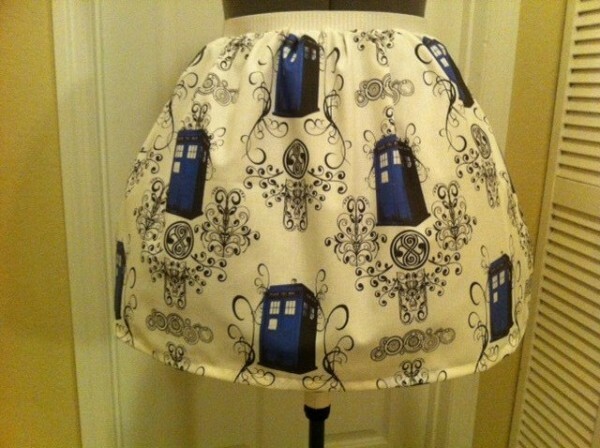 Etsy seller NerdAlertCreations is selling this awesome Doctor Who skirt with a bunch of TARDIS’ on it for just $45. The skirt measures 18″ in length (21″ possible) and fits from small to extra-large. If you are looking to catch the eye of that special Whovian in your life, wearing this is sure to do that! If you do get this skirt, be sure to send us pictures of you wearing it! We would love to see!